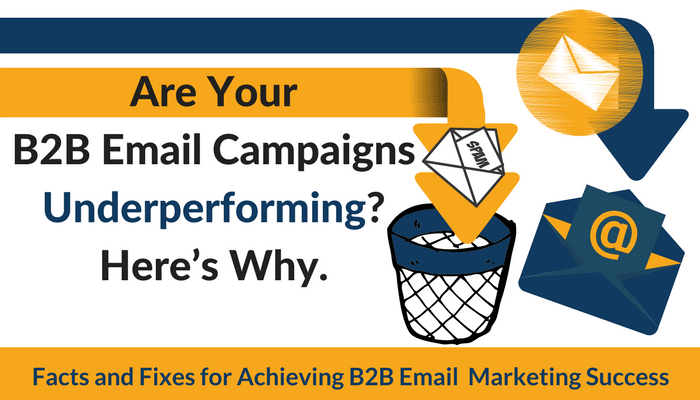 Are Your B2B Email Campaigns Underperforming? Here’s Why. So why do B2B email marketing campaigns fall flat? We’ve shared some common missteps made by marketing teams, as well as the solutions to get your campaign in a better place. These are the lowest quality of email lists and should be avoided. Purchased lists often come with bad emails—incorrect or outdated information leads to high bounce and opt-out rates. An even greater risk of using a purchased list is the potential of “SPAM traps,” also known as “honeypots.” When emails are sent to these addresses, the likelihood that your domain will be blacklisted is high. Once that happens, it may be challenging to deliver any emails, and removing your domain from a blacklist is a complicated and time-consuming process. Avoid purchased lists! You may enjoy reading another of our articles on avoiding email spam triggers. These lists are usually more accurate than purchased email lists. Many publications, associations, and list aggregators will rent out their B2B email lists on a limited basis. On the positive side, these list sources generally allow you to target the list by selecting a publication or list owner that most closely matches your target audience. Additionally, you can often specify geography, job titles, functional area, and company size. Besides the cost, a downside to pursuing this avenue is those list owners are not often willing to part with their list. You may be required to develop the email campaign and then deliver the files to the list owner for distribution on your behalf. After the email is sent, you can expect a response report that includes the data for sends, opens, and clicks. To leverage a rented list, you must have a compelling call to action that encourages recipients to engage with your brand and share their contact information. These lists are the best option, but take time to build. Organically grown lists typically develop over time from marketing and sales activities like trade shows, webinars, online engagement, partner shared lists, etc. We have seen the highest success rates with these lists, as they are targeted to your markets, and often to recipients specifically interested in your offers. Once you have begun building your email list and actively sending emails to it, be mindful of practicing list hygiene. Regular database management and maintenance or scrub practice will ensure strong list quality. Before each email is sent, remove any opted out email addresses, SPAM complaints or “hard bounces” (undeliverable). Removing these will increase the reported response rates of the new campaign. We also recommend removing any recipients from the list that haven’t opened an email in the past six months. that have not opened any of your messages in the past 6 months. Those addresses can go into an “inactive” list, and opportunities for re-engagement campaigns can be created. Every six months, a re-engagement campaign can be sent to the inactive list as an attempt to bring them back into the lead nurture path. If inactive recipients don’t respond after a few attempts, it may be time to remove them from your list permanently. Another reason your B2B email marketing campaigns may be underperforming is the frequency of your campaigns oversaturation can cause fatigue, which can, in turn, result in opt-outs or deletes. This opens up an opportunity for batch testing frequency rates and observing what works and what doesn’t. Make sure to monitor all emails to addresses not just the campaigns that you individually manage. Once you have built a great B2B email marketing list, use it wisely. In order to increase response rates and reduce unsubscribes, you should always consider the relevance of each message to the prospect segment. Try to focus messages on the segment of your list that is most likely to find your message relevant. A focus on message relevancy will significantly improve response rates and recipient engagement. You should also experience a much lower unsubscribe rate and minimal SPAM complaints. Authentic content directed to the correct audience can be a powerful conversion tool. Are you interested in learning more about what it takes to implement a smart, strategic email campaigns to boost success? Get in touch with the experts at ResponsePoint. If you’d like to schedule a brief chat with the ResponsePoint team, we can discuss your current campaign approach and help you discover better ways to improve your email processes, and campaigns success. The simpler the design, the less likely your messages will get caught in SPAM filters. This means better response rates and more engagement. Generally, keep the image-to-text ratio low. SPAM filters often block messages with a lot of image content. Current B2B email best practices are for emails with less of a marketing feel and more of a sales message. Keep the message concise. Don’t expect your prospects will read or scroll through long messages. Limit “newsletter” style messages to 3 or 4 topics. Consider the placement of your call to actions. They should be prominent and “above-the-fold” when possible. Make it clear to the recipient what you want them to do. Subject lines should be direct and concise. Avoid using all caps and/or question marks. SPAM filters will often stop these messages from getting through. Punctuation such as exclamation points can see a bump if used sparingly. Edit the preview text to complement the subject line. Many prospects scan through their inboxes looking at the subject line, preview text and sender address to determine if they will read the message. Use the preview text to engage the prospect. Design B2B email with mobile in mind. Look at reporting to see how emails are being viewed. With these in place, email servers that receive your messages are more confident that the sender is a legitimate business and not a spammer or other nefarious user of email. DMARC is actually built on top of existing DKIM and SPF mechanisms. If you want more details, here is a great article at ReturnPath. Another factor that influences the deliverability of your B2B email campaign messages is the overall reputation of your sending domain or IP addresses. Factors that influence your sending reputation include how frequently email from your domain was caught by SPAM filters or went to the inbox directly. The frequency that your prospects mark your messages as “SPAM” or “not SPAM” is also considered in your sending domain reputation. Finally, don’t “flood” receiving servers with messages containing the same content. This can cause your messages to be stopped before the inbox. When you are sending the same message to a large list consider sending the messages out over a time period. Many email platforms have this as an option. They will send out smaller batches of your message over a time period that you set or that it is sent during the recipient’s time zone. B2B email is a valuable communication method to engage with your prospective market, but only when approached strategically and methodically. If you’d like to schedule a brief chat with the ResponsePoint team, we can discuss your current campaign approach and help you discover better ways to improve your email processes, and campaigns success.